Nothing beats the sweet nostalgia of vintage apparel, but I do adore even vintage-esque styles on women. I was recently introduced to 'Miss Patina', which specialises in such outfits, many of which I found to be very beautiful. The good news - they have a sample sale in London this weekend. The even better news - you can redeem 10% off with the voucher below (click to zoom). Now don't think I'm promoting for the sake of promoting! I am interviewing Miss Patina at the sale this Saturday, so I may get to know the brand better. But in the meantime, why not gift my readers? 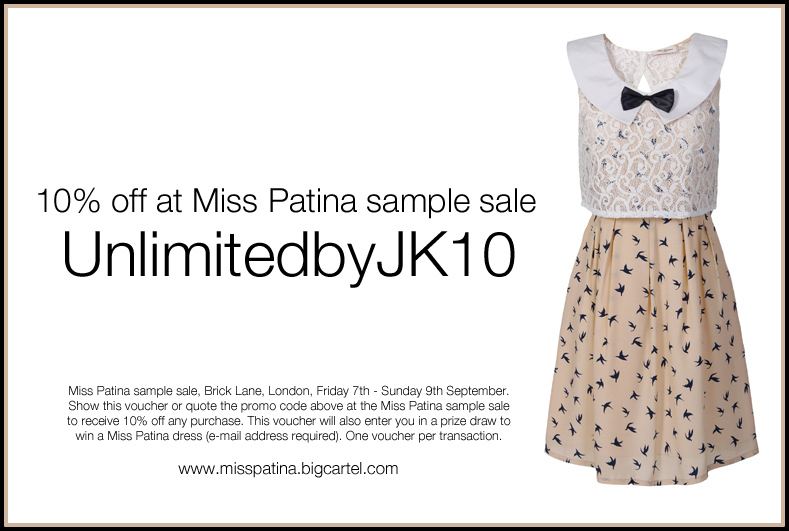 I am not offering diamonds, but if you browse the Miss Patina online shop, you may just be tempted to visit their sample sale on Brick Lane*, voucher in hand. And if you do, I may even snap you for my street style photos. I hope this offer tickles your fancy, and maybe I will see you on Brick Lane this weekend.